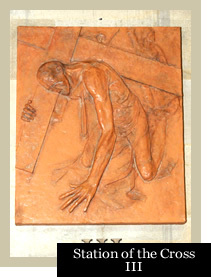 The Stations of the Cross were introduced into St Matthew's Church in April 1987, and are situated around the perimeter of the nave, spaced between the window apertures of the south and north aisles in an anti-clockwise progression. 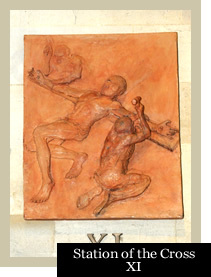 The fourteen reliefs were modelled in clay by the sculptor David Thomas, his first major religious work. Thomas studied at Croydon School of Art. After war service with the Royal Navy (Coastal Forces), he took a degree at the Courtauld Institute, studying the Art of the Renaissance under the late Professor Johannes Wilde, and made prolonged visits to Italy. He was offered a lectureship there which he held until the mid-1950s. 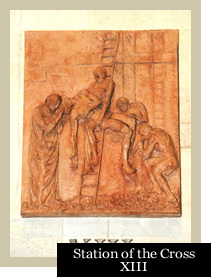 After some years in art administration he returned to sculpture in 1963. David Thomas was engaged on these Stations from 1984 when his designs were selected by competition. They were subsequently cast by Mr D C Giles of the British Museum. 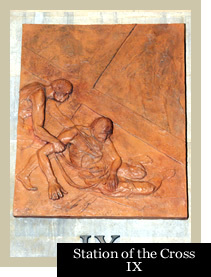 Each relief is of a resin-based composition to simulate the colour and texture of terracotta. 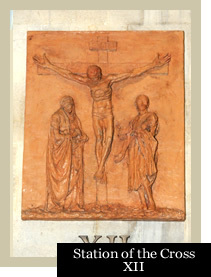 The intention had been to use terracotta itself but the material was found to be unusable for the scale of the design Thomas felt St Matthew's proportions required. 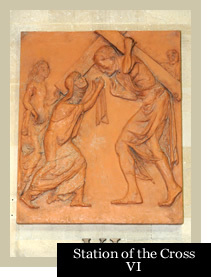 The 14 Stations of the Cross, which depict the events of the final journey of Christ from trial before Pilate to burial, warm considerably the appearance of the nave. 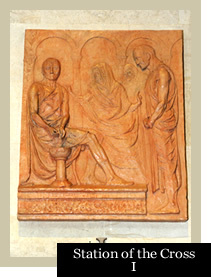 A further example of Thomas’ work may be found in West Sussex where he subsequently designed and modelled the scene of Christ's Resurrection cast in bronze for the tympanum of the Romanesque Church. 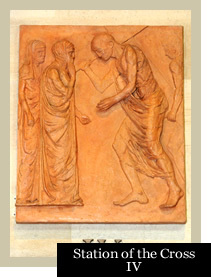 Notice the sculptor’s dramatic use of relief to draw the eye and help the viewer distinguish the more important aspects first. Also for dramatic purposes the sculptor has throughout the series in various ways distorted normal bodily proportions. 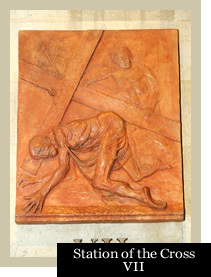 Jesus falls three times whilst carrying his cross. Each time the fall is heavier than before. Notice the apparent ‘rotation’ of the cross with each fall to the point where the right way up is not clear signifying, perhaps, growing disorientation. 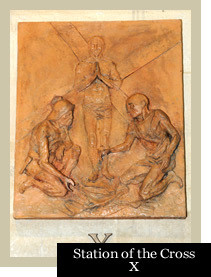 At Station IX – ‘Jesus Falls the Third Time’, notice the contortion of Jesus’ body. Two different kinds of power face each other. Pilate could find no fault in Jesus, but handed him over to the people – a weak and fearful ruler swayed by a violent crowd. On one level it made little difference to Pilate whether one Jew lived or died, and it enabled him to obtain from the crowd the useful affirmation that they had no King but Caesar. Yet, he sensed that Jesus was unique, and washed his hands in a vain attempt to wash away his part in Christ’s death. The slow procession to the place of execution began, and Jesus, though weak from continuous questioning, mocking and beating, was made to carry his own cross. He was led away as a common criminal to suffer one of the most degrading forms of execution ever invented. But the burden that Jesus had to carry was much greater than the physical weight of the cross, for he also had to carry the sins of us all. Weakened by the unbearable torments that he had already gone through, the added weight of the cross was too much for Jesus, and he fell. As he knelt there the cry of anguish that he was later to utter cannot have been far from his lips, "My God, my God, why have you forsaken me?" We sometimes feel alone: that God has forsaken us and does not answer our prayers. But we, like Jesus, must know in our hearts that however far away God seems to be, he never forsakes us – he is always faithful. Mary had brought up her son through many hardships, and cared for him as a loving mother. Her appearance is beyond her years. Now she saw him, barely recognizable except to her eyes, being led to his death at little over thirty years of age. Was this really what he had meant when he said, “Did you not know that I must be busy with my Father’s affairs?” Certainly this was the sword that the old man Simeon had predicted would pierce her soul. But Mary, unlike most of the disciples, did not desert her son in his time of greatest need, but stood by him to the end. Let us ask that we too may have a faith like Mary, to stand by Jesus whatever the cost. 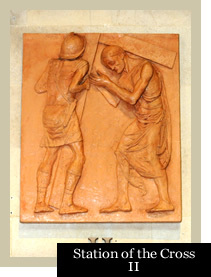 Jesus was so weak that the soldiers were afraid that he may not reach the place of execution, so they forced a passer-by, a complete stranger, to carry his cross. Simon no doubt tried to refuse, but in the end did carry the cross. Only the day before, the disciples had insisted that they would remain faithful to Jesus whatever happened, but first they fell asleep in the garden, and then after the arrest they ran away. How like the parable that Jesus had told, where it was the unwilling son who in fact did what his father wanted. Words and empty promises are not enough. 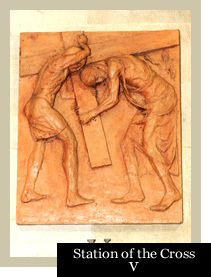 We, like Simon, must take up our cross and share in Christ’s passion in our daily lives. In a great act of kindness a woman stepped forward from the crowd and wiped the bloodstained face of Jesus. A few days earlier another woman had anointed Jesus with costly perfume. A few hours later a man would give Jesus his tomb. All of these were acts of love and charity to the Lord. And we can perform similar acts of charity to Jesus, living now in our brothers and sisters in need. For whatever we do to help one another we do it for Jesus. A little further along the road Jesus stumbled and fell again. He must have felt so utterly exhausted and desolate that he could not possibly go any further. But he had to go on to fulfill his Father’s will, and so again he struggled to his feet and carried on. Sometimes we too feel that things are hopeless; that we cannot go on. But we too have God’s work to do, and we too must continue with trust and faith in the power of Jesus working in us. Some pious women began to weep for Jesus, and tried to console him, but he told them not to weep for him, but for themselves and for their children. Jesus was in agony, and yet he refused their consolation, not through ingratitude, but because he knew the agony that they and others would suffer because of their rejection of him. When we feel rejected or badly treated, we must remember this example of Jesus. We must still remember others who are suffering, perhaps more than we are, and who need our help and compassion, and not let ourselves become caught up in self-pity. Three times Jesus resisted the temptations of Satan in the wilderness. Three times Peter denied he knew Jesus. Three times Jesus fell to the ground on the way to Calvary. Just as Jesus forgave Peter even that threefold denial, so he will forgive us if we turn to him in penitence. No sin is too great for Jesus to forgive, so long as we are truly sorry, and are prepared to rely on his love and forgiveness rather than on our own efforts. Even after this third and heaviest fall, Jesus once again struggled to his feet and continued. And so must we – even in the moment of our greatest fall we must not lose hope, but get up and continue with faith in our Lord’s merciful love. The journey was over – they had arrived at last at the place of execution. First they stripped Jesus of his clothing, and so he ended his life as he had begun it – with nothing. We have clothing and enough food, and many other comforts which we rightly enjoy, but we must not become so involved with the things of this world that we lose sight of what really matters. We must keep our sight firmly fixed on God, and be ready to share what we have, and ready to accept whatever comes to us in his name – even being left with nothing. Jesus stretched out his arms on the cross in a gesture of forgiveness for the whole world. Before he died, he had time for two further particular acts of forgiveness. First, he forgave his executioners even as they hammered in the nails; then he forgave the penitent thief who was crucified with him. Just as Jesus forgave them, so he always forgives us when we sin; and so also must we forgive others who wrong us. But of course, it was not all over – it was only the beginning. Christ had to die so that we could live. As the soldier pierced his side, out flowed the blood and water that was to seal the new and everlasting covenant between God and the world. Jesus hung dead on the cross, and so now did the two thieves. The crowds had gone home. The soldiers, their duty done, had left. Silence descended upon Calvary. The body of Jesus was carefully taken down from the cross and laid in Mary’s arms. Now she carried her son’s lifeless body in her arms, as once she had carried his unborn body in her womb, for this death was the prelude to new life. 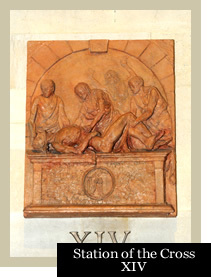 The body of Jesus is prepared for burial as was the custom and placed in the tomb. But not even the power of death could hold him. Christ had to die and be buried before he could rise again. In the same way, we too have to die and be buried with Christ in the waters of baptism, so that we too rise again to new life with him. Ours is the task to try to live that risen life here on earth, so that when our time comes to die, we may pass through the gates of death to new and everlasting life with Jesus.